Independent trade unions in Algeria continue their long fight for rights in the face of ongoing repression. On February 3, police forcefully broke up a sit-in in front of the Ministry of Employment, Labour and Social Security by independent unions, including the IUF-affiliated SNATEG, demanding the reinstatement of trade union representatives dismissed from their jobs at the state electricity utility SONELGAZ. Four demonstrators were arrested and held but later released. 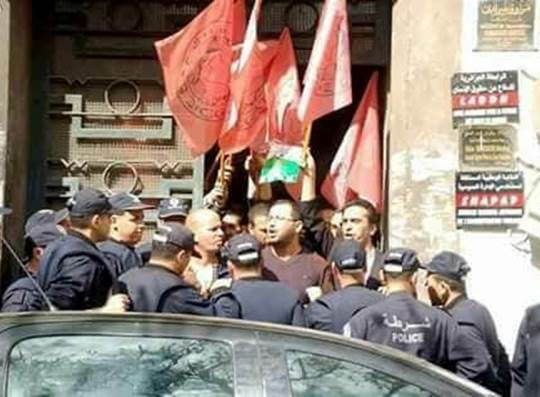 On December 27, 2018, police dispersed a demonstration in central Algiers, arresting over a dozen representatives from 3 independent unions, including SNATEG. Since 2017 SNATEG has campaigned for the reinstatement of nearly 50 union members and representatives dismissed from their jobs at SONELGAZ. Over the course of the campaign, some of them have been allowed to return to work at a lower pay grade provided they dropped all claims and pledged in writing to renounce their union membership. SNATEG continues to demand the unconditional reinstatement of 11 union leaders who have refused the blackmail, at the cost of blacklisting and extreme hardship. SNATEG leaders, including the president and general secretary, collectively face years of prison time after being repeatedly convicted for 'defaming' SONELGAZ in farcical legal proceedings. The unions are also calling on the government to implement the repeated recommendations of the ILO to cease its attacks on independent union organizations and respect the right of all workers in Algeria to organize independently of the state-controlled union organizations.